American Horror Story: Coven lands on Blu-ray in time for Halloween. Entertainment Weekly celebrated its release with a behind-the-scenes exclusive about the shooting of an episode that some of the cast revealed was “sometimes just as scary as watching it”. “As with previous seasons, there are numerous colour grading gambits employed, as well as tweaks like added grain, distressing and other digital tools that provide variety if not always clarity. “Visual quality is softer than one might expect, possibly due to glamour photography for the predominantly female cast or possibly for the sake of effect. Another small screen horror, Supernatural, is being re-released in a nine-season box set. Fresh from its theatrical run comes The Fault in Our Stars, which was shot digitally with the Arri Alex. “This high definition presentation is buoyed by the nice range of tones and lighting that the Alexa can capture. 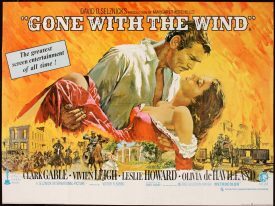 Gone With the Wind’s 75th anniversary edition seems largely the same as the last commemorative edition. “The film is a high-definition upgrade of the comprehensive 8K digital restoration of the film made in 2004, and it looks gorgeous. Also being dusted off in new Icons packaging are Rocky, Silence of the Lambs, Terminator and Spaceballs.